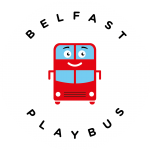 Belfast Playbus - Book Your Belfast Playbus Party Now! We cover Belfast City Centre at Standard Cost, we are happy to travel, however there will be an additional fuel surcharge outside of Belfast depending on Postcode Area. Surcharge will be advised when booking request is received, so you will know the full total cost before booking is confirmed.